Color. White kitchens are clean, pristine, and modern but they don't have to be monotone. Colors that are coming on strong are teal, a deep bluish green and marine blue, a saturated greenish blue. 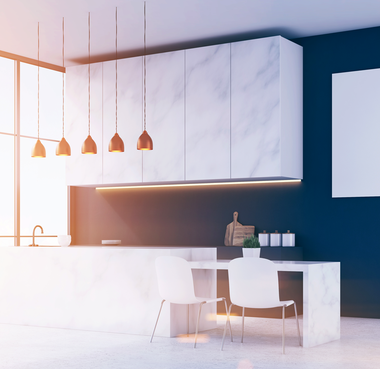 If you love white, or white and grey kitchens, think about adding more color to the island, walls, cabinets or backsplash. Workstations. Whether you're baking, grilling or using the stovetop, install multiple food preparation areas for chopping and mixing. Family and friends can cook together, making meal preparation a fun bonding activity. You can separate foods for individual diets, like gluten-free, and clean up is easier. Beverage stations. Taking the place of butler's pantries, when no one has a butler these days, are beverage stations adjoining the kitchen. Chose the appliances around your favorite drinks, including coffee machines, smoothie makers, wine storage, juice bars and cocktail mixing. A good lender will get you preapproved for a loan before you make an offer to buy a home. There's really no way to speed up this process, so it's best if you start now. Your lender will need time to run your credit, check your employment history, and see what loans you can get and for how much. You may find a home you want to buy, but in a fast market, sellers know they have the advantage. They may refuse to consider FHA, VA or other conforming loans because they don't want to go through the more rigorous appraisal process. Sellers may ask that you make your highest and best offer by a certain date, which is often over list price. You're competing with all-cash buyers and 20-percent - down buyers, so consider shopping for homes under your highest price range. Communicate often with your lender. Send them the MLS numbers of the homes you're interested in. They'll tell you what you need to offer, how much you'll need to put down, and how high you can go, as well as provide a preapproval letter for the seller to accompany your offer. For example, something like HOA fees will raise your monthly debt and impact how much home you can buy. As a home seller, it's important to understand that all built-ins remain with the home, but what do you plan to do about items like refrigerators, chandeliers, washers, dryers and other fixtures? Yes, it would convey, but it can also be replaced or excluded. The key is to replace it before your Berkshire Hathaway HomeServices network professional begins marketing. Your other option is to leave it in place, and exclude it in the MLS remarks section of the listing. What you can't do is exclude it in your response to the buyer's offer, because all promises contained in the MLS listing document become part of your contract, so you can't make an exclusion after the fact. Your network sales professional will let you know about the market and if it's to your advantage to convey or exclude. 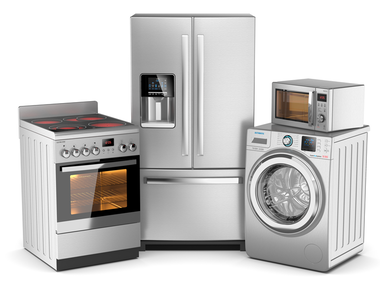 If you have new appliances, for example, they are valuable enough to take with you, but they may also be valuable to your buyer. Your sales contract should have a section that covers personal property and fixtures. This is where your buyer may ask for something to convey, such as the refrigerator. Then, it's your choice to do so, or use it as a negotiation tool. 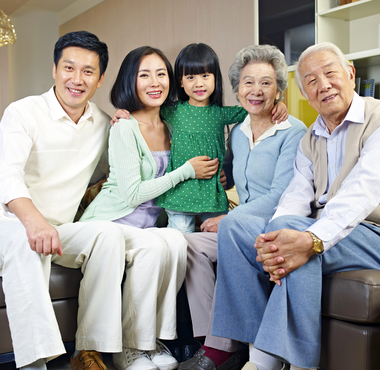 Helping aging parents while managing careers and raising a family can be a challenge. If you're considering having your parents live with you, this list will help you choose the right home to meet everyone's wants and needs. First, sit everyone down who will be affected by the arrangement for a friendly pow-wow. Ask for a wish list from each person, including the kids, of desired features in a new home. Ask for concerns and expectations, and you can head off potential conflicts in advance. Make sure your parents don't feel like indentured babysitters, and that kids show respect for your parents' age and limitations. Make sure everyone knows that you'll do your best to meet as many wants and needs as possible, but you'll have to prioritize. Compromises and patience will be required of everyone. Who will own the new home? If you use your parents' retirement income to buy a home, it will help you qualify for a larger, more expensive place. They can be tenants-in-common and be equally responsible for paying the mortgage. All co-owners must qualify with the lender. Last, consider privacy for all concerned. It's ideal if your parents can have their own suite of rooms, including a bedroom, living area, private bath and kitchenette.